The Vimy Cross, located above the tablets on the west wall, is the original cross that was erected following the successful capture of Vimy Ridge by the Canadian Corps on 9 April 1917. It is the largest of the three crosses erected in the temporary cemeteries at that battlefield, the other two relating to other units. In May 1917, the Officers of the 21st Battalion suggested a cross should be built to commemorate their comrades lost in the hard fought battle for Vimy Ridge. The cross was erected in a cemetery near the village of Thélus, France. This cemetery held the bodies of the members of the 21st lost in the battle for Vimy Ridge. A member of the 21st, Pte George Williams of Cornwall Ontario, was severely wounded at the Somme. After hospitalization and convalescence, he returned to the unit and was put on light duties in the Transport Section. He was a carpenter by trade and undertook to construct the cross from the wood salvaged from the battlefield area before painting it white. The officers funded the accompanying plaque with the following inscription “IN MEMORY OF OFFICERS, NCO’S, AND MEN OF THE 21ST CANADIAN INFANTRY BATTALION KILLED IN ACTION APRIL 9, 1917“. This Vimy Cross remained at the cemetery for a number of years. It was later decided by the surviving members of the 21st Battalion that the Cross be moved to Kingston, where the Battalion was formed. Through the efforts of LtCol Henry Edward Pense D.S.O., M.C., Commanding Officer the Princess of Wales’ Own Rifles, 3 Feb 1920 – 15 Dec 1922, the Vimy Cross was returned to Kingston and placed on the grounds of Royal Military College. Services were held annually at the Vimy Cross on November 11th, Armistice Day, and April 9th, Vimy Day. 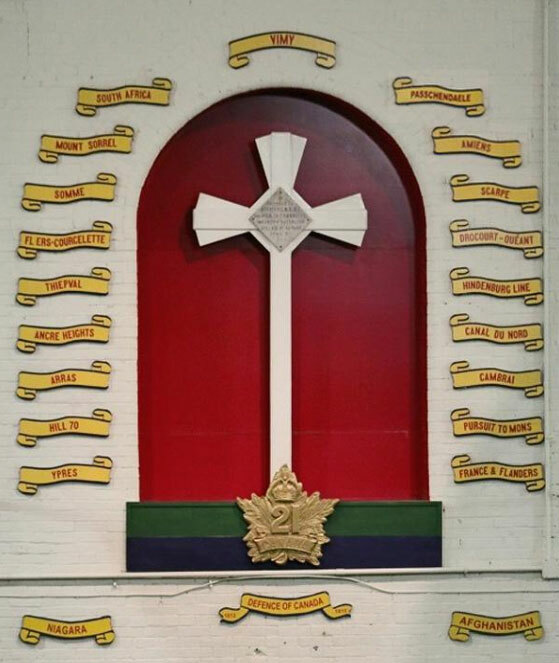 In the Fall of 1992, the Cross, was displaced by building expansion at RMC, and as survivors of the 21st Battalion were aging, it was moved to the Armouries. The Princess of Wales’ Own Regiment, the perpetuating unit, had the Vimy Cross mounted on the Wall of Honour above the Parade Square surrounded by its Battle Honours. Services are held annually by members of Regimental family every April. During this service, the name of every 21st Battalion soldier killed at Vimy Ridge is read aloud, so that we will remember the sacrifices made at the BATTLE OF VIMY RIDGE 9 APRIL 1917. As one of Canada’s oldest military organizations, members of the Princess of Wales’ Own Regiment have been seen in all Canadian conflicts, including those predating Confederation. The Regiment holds dear to its own service, as well as perpetuating the military service of the citizen soldiers of Kingston, including the Volunteer Militia Rifle Companies of Kingston, the 14th Battalion Canadian Militia, and the 21st, 59th, and 253rd Battalions of the Canadian Expeditionary Force. Perpetuating the service of the members of The Princess of Wales’ Own Regiment who served with the Stormont, Dundas and Glengarry Highlanders during World War II.